The Sleeveless Vest with Rhinestone Zipper is another classy, specialized salon product from the experts at Salonwear. This stylish-looking zipper vest is skillfully designed to not only look stylish but also provide comfort to your clients. Made from the highest quality fabric, this men’s zipper vest ensures that your clients have a hassle-free experience in your salon environment. At Salonwear, we offer only the best products that will help your staff members perform their day-to-day salon tasks with absolute comfort. 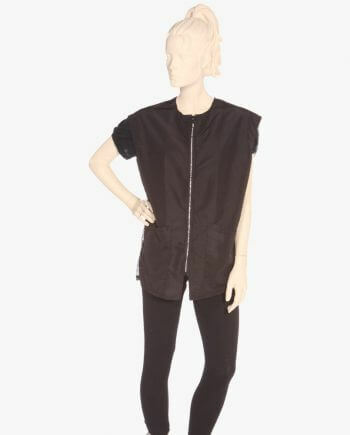 Clients looking for a trendy and reliable stylist vest, salon zipper vest have reached the perfect place. Salonwear’s delicate rhinestone zipper vest is produced from top quality contemporary fabric. This trendy women’s zip-up vest with the bedazzled zipper is not only functional for your clients and staff, but also adds a sparkle to your salon and spa. The durable fabric ensures that you get multiple uses from the vest. Salonwear believes in offering only the best quality products at the most reasonable prices. Salonwear’s sleeveless vest is a zipper vest with a front rhinestone zipper, two front patch pockets and a mesh back. The special mesh back panel in the vest with zipper helps in air circulation and provides added comfort. The special feature of the zipper vest is the presence of the rhinestone zipper that adds an extra sparkle to the spa and salon outfit. This vest is made of silkara iridescent fabric that safeguards your clients from stain and chemical spillage. Salonwear’s sleeveless vest with rhinestone zipper is available in the timeless and bold black color. You do not have to worry about sizes, as they are available in all three basic sizes – small, medium and large. Apart from the wide range of top quality spa and salon apparel and accessories that we offer, we also offer the unique option of customization. You can easily get your spa and salon apparel customized with your logo. This, in turn, will help bring unison and instill a sense of solidarity and professionalism among the team members. Salonwear uses screen printing and embroidery techniques to provide you with the wonderful customized products that are bound to impress your clients. This allows you to create a brand presence and helps in continued business from your clients. This black zip vest customized with your logo is sure to capture everyone’s attention. Why Choose Salonwear for Mens Zipper Vest? Salonwear has been a prominent leader in the US salon industry for the last 31 years. We aim to provide convenience to our clients by providing top-quality salon products with classy designs, all in one space at the best possible prices. Our experience and expertise have made us a distinguished business that clients can sincerely rely upon. We strive to successfully induct our clients to this special Salonwear family.